Posted on 26 September 2014, in French Fridays with Dorie, Salads and tagged French Fridays with Dorie, salad. Bookmark the permalink. 14 Comments. 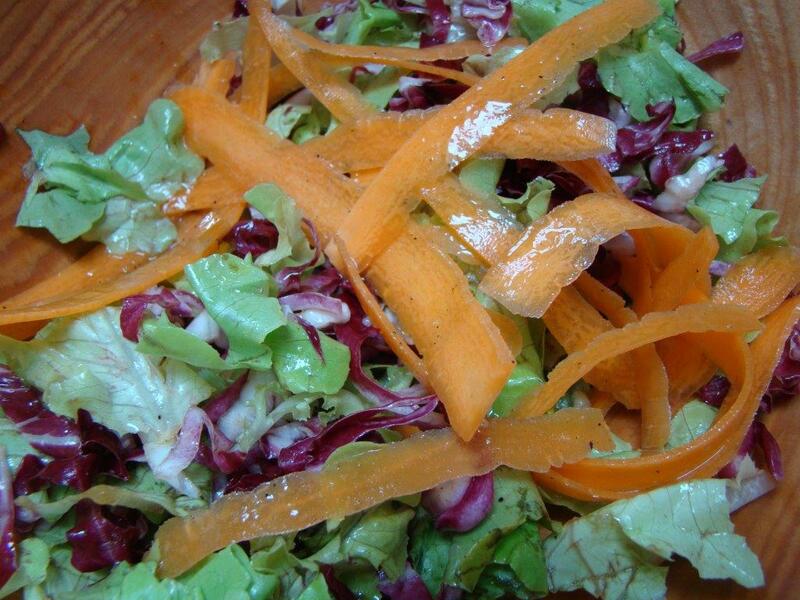 We eat salads often and it’s always good to have one more easy dressing recipe in the back burner. I liked the ‘mysterious’ notes. This was interesting; I think Susan’s suggestion about trying the dressing with a pear salad was a good one. Pear, goat cheese, figs on a bed of arugula sounds good to me! This salad has not gotten a ringing endorsement from anyone but Liz and Susan. When Diane reported earlier in the week that her son thought it tasted like vanilla ice cream, I just decided to pass. My mandoline and I had an “incident” last week and I didn’t want to visit it for a while. I do like the line-up for October – nice choices, don’t you think. I actually am having fun visiting some of the really must-try recipes that you all made before I joined. I agree not much to say about this salad. I found the vanilla flavor strong. I guess I’m sensitive. On well, so many other recipes that are wonderful. Well I enjoyed the salad, it was good too cold the next day for lunch! I must say the raw zuc was good too. A colorful salad that was worth trying, but probably won’t be a repeat at my house. I like the idea of the zucchini gratin. I enjoyed the salad and thought it was very pretty, but I don’t think I’ll go out of my way to have it again. I happen to love raw squash, and it seemed to add a little more crunch to the mix. I also thought of throwing in a few fresh figs, I personally think this dressing would work so well with fruit! I did enjoy the subtle flavor of the vanilla! Sorry this wasn’t a winner for you, however your zucchini gratin sounds wonderful! Happy weekend, Betsy! Hi Betsy, it didn’t knock my socks off either! It was OK, neither great nor terrible. I felt exactly the same way about this one! Not much to say.